Tourism and labor leaders are still talking about a hotel tax hike to bankroll a Convention Center expansion, and they’ve notified the city attorney that they’re forming a committee to get it done. Power-brokers and labor leaders are laying the groundwork for a citizens’ initiative to hike hotel taxes and expand the Convention Center. They haven’t cut a deal yet but appear to be preparing for a 2018 ballot measure that would rely on a hotel-tax increase to raise cash for Convention Center construction plus homelessness initiatives and road repairs. Two potential names for the effort have also surfaced in recent exchanges with city officials. Pasadena-based attorney Michael Colantuono, who represents the city and San Diego’s Tourism Marketing District, asked the city for the go-ahead to also represent a group known as Yes for a Better San Diego, in a letter obtained by Voice of San Diego. In an earlier note, he referred to the group as Citizens for a Better San Diego. Colantuono didn’t elaborate on what the measure will entail and those in negotiations won’t either. His request to represent the group has yet to be approved by the city, and he did not return messages. He needed to request permission to represent the group because he has worked with the city and there’s been discussion of at least one other ballot measure, which might pose a conflict of interest. But the attorney’s communications with city attorney’s office offer a window into the work happening behind the scenes. Tourism, business and union leaders have continued to try to hash out an agreement on a 2018 ballot measure they can all back. They’re not saying much about it. Among those who’ve continued to discuss possibilities are representatives from the Chamber of Commerce, the San Diego and Imperial Counties Labor Council, hotel workers’ union Unite Here Local 30, the local Building and Construction Trades Council and prominent hotel executives Robert Gleason and Mike McDowell. Nearly all referred comments on the measure to spokeswoman Laura Fink, who would only say San Diegans should stay tuned in the new year. McDowell did not respond to messages from VOSD. “Our diverse group looks forward to the launch of significant plans for San Diego’s future in 2018,” Fink wrote in an email. Others previously involved in the negotiations confirmed they are no longer attending meetings. Homeless advocate Michael McConnell, leaders for the refugee advocacy group Partnership for the Advancement of New Americans and land-use consultant Joe LaCava all said they’re no longer at the table. Fink did not respond to questions about the makeup of the ballot measure or the group trying to hash out a deal. Nor did she specify when a proposal might be unveiled, or if there are other measures the group might support. For example, affordable housing advocacy group San Diego Housing Federation is floating a November 2018 citizens’ initiative to increase property taxes and fund thousands of new homes. City Councilman David Alvarez has also pitched a measure that would invest increases in hotel-tax hauls over the next 20 years in homelessness needs. A measure similar to the one Colantuono described in his letter pushed by Mayor Kevin Faulconer fell apart last year amid outcry from labor and other voices that the proposal didn’t invest enough in addressing San Diego’s homeless crisis and ran afoul of two ballot measures that aimed to hold elections when more voters go to the polls. It’s not clear how closely their pitch will match Faulconer’s failed effort this year. His proposal planned to invest more than 60 percent of proceeds in the first 10 years to Convention Center construction and about 18 percent each to homelessness and road repairs, a breakdown that wasn’t palatable to unions now at the negotiating table with hoteliers. City Council Democrats ultimately refused to put the measure on the November 2017 ballot. After Faulconer’s measure fizzled, the business community decided to proceed with a citizens’ initiative. Early on, power-brokers decided labor’s support would be crucial to any measure’s success. Then a blockbuster court decision suggested citizens’ initiatives in the state could pass with a simple majority of voters’ support, instead of two-thirds. 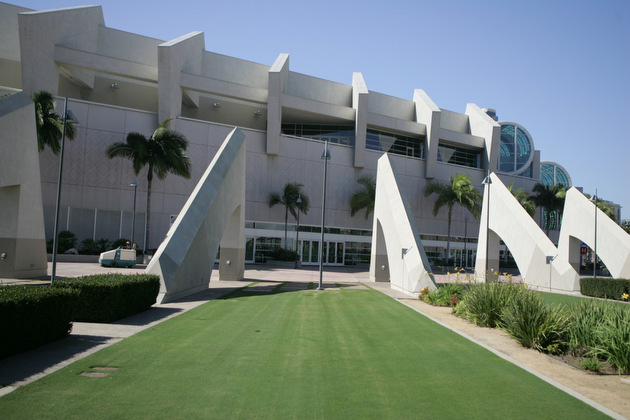 A spokeswoman for Faulconer, who has for years advocated for a Convention Center expansion, said the mayor’s looking on rather than leading ballot measure discussions this go-round. “He is monitoring the work of various groups closely and he applauds these stakeholders for making these issues a top priority,” spokeswoman Christina Chadwick wrote in an email. Keith Maddox, a national representative of the AFL-CIO who’s currently leading the Labor Council, said his group has been in and out of the negotiations but is hopeful a deal can be reached soon. Maddox said his group supports a Convention Center expansion but has focused much of its more recent advocacy on housing issues. That applies to the Convention Center measure too – and his group isn’t ready to sign off just yet.